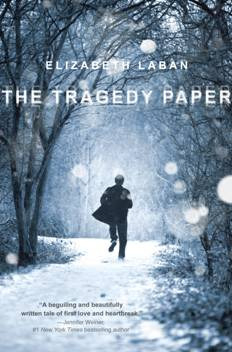 The Tragedy Paper by debut novelist Elizabeth Laban, is an engrossing young adult novel about forbidden love and desperate secrets and the SheKnows Red Hot Book of the week. From chapter one, you’ll be immediately intrigued by The Tragedy Paper, a gripping young adult novel with a clever and exciting premise. Duncan is a senior at the Irving School, and when he moves into his new room for his final year he finds CDs left for him by Tim, a student who attended the school the year before. On these CDs, Tim tells his story, one so captivating that Duncan will ultimately use it to write his Tragedy Paper, the school’s version of a senior thesis assigned by the school’s least forgiving teacher. The motto of the Irving boarding school is: “Enter here to be and find a friend.” But when Tim, a 17-year-old albino transfer student, reads this, he’s uninspired. He just wants to fly under the radar and graduate. But despite his efforts to go unnoticed, he falls for a girl. And not just any girl — she’s Vanessa Sheller, the girlfriend of the most popular guys on campus. Tim is nothing short of surprised when he finds out Vanessa likes him too. But she could never let anyone know that — she has a social status to uphold. And so begins a secret relationship, all while their senior project looms. The Tragedy Paper alternates between the viewpoints of Tim and Duncan — two very different, yet in many ways, similar — teenage boys. A compelling story of forbidden love, tenuous friendship and the desperate lengths people will go to to keep secrets, you’ll be captivated and determined to read faster than you ever have so you can find out how this story ends. You won’t be disappointed!